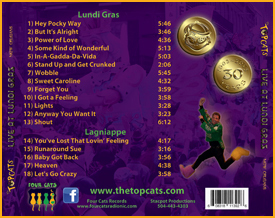 On May 17th, 2013 The Topcats released “Live at Lundi Gras”, a collection of eighteen songs released in celebration of The Topcats 30h Anniversary! 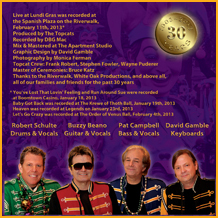 Live at Lundi Gras was recorded on February 11th, 2013 at New Orleans’ Official Lundi Gras Celebration at the Spanish Plaza on the Riverwalk in downtown New Orleans. This recording was produced and mixed by The Topcats, with graphic design by David Gamble. 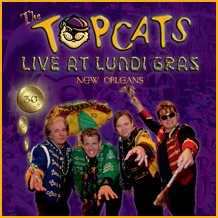 Live at Lundi Gras captures the band in a great concert setting with a very enthusiastic crowd, and features a good variety of songs that truly show the energy of a live Topcat performance. Starting with the old Meters’ favorite, “Hey Pocky Way”, the band flows into a medley of “But It’s Alright”, “Power of Love”, “Some Kind of Wonderful”, and “a shorter version of In-A-Gadda-Da-Vida. The set continues with “Stand Up and Get Crunked”, the “Wobble”, “Sweet Caroline”, “Forget You”, and “I Got a Feeling”. The band then shifts into a rock mode for “Lights” and “Anyway You Want It”, ending the concert with the best of closers, “Shout”! The disc also features five “Lagniappe” songs: “You’ve Lost That Lovin’ Feeling” and “Runaround Sue”, recorded at Boomtown Casino New Orleans on January 18th, 2013, “Baby Got Back”, recorded at the Krewe of Thoth Ball on January 19th, 2013, “Heaven”, recorded at Legends on January 23rd, 2013, and “Let’s Go Crazy”, recorded at the Order of Venus Ball on February 4th, 2013. Check out the songs in the player below.